The Wolfburn Morven is named after the highest mountain in the northern Highlands. For "Morven" only slightly turfed malt is used and so it differs clearly from Wolfburn "Northland" and "Aurora", which are produced from undetached malt. It is exciting that despite the malt specification of only 10 ppm, the peat leaves intense traces and occurs much more clearly than one would expect. Morven is okay, but not more than that (the No 128, considered to be the precursor to this release, is much better). Around 60 EUR. The nose is surprisingly soft (especially after the No 128) and offers up a mild trace of smoke and some young apples and pears. Quite mineral (chalk!) and clearly young. 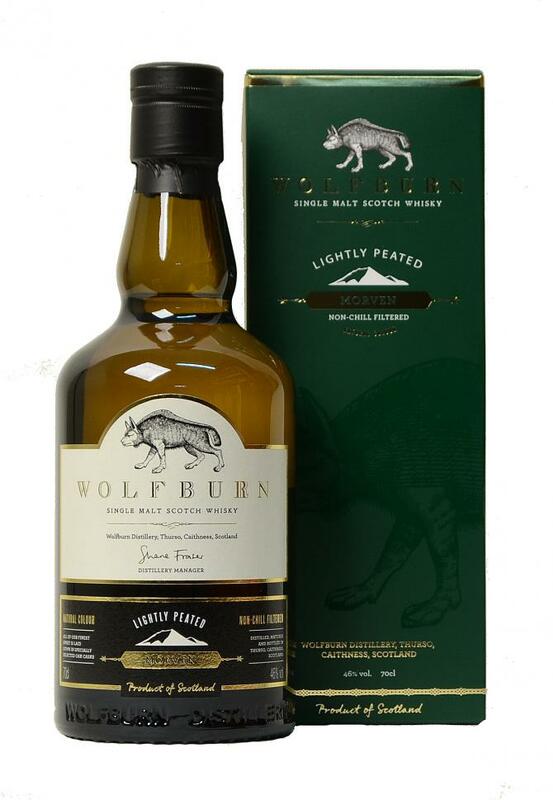 That does not have to be a problem, but this Wolfburn is not as intriguing on the nose. A salty edge brings us to a wild coast. Salted caramel and pine nuts with some floral accents. It is quite fresh and young on the palate. Lime juice with pepper, vanilla and baked apples. Pear drops. The peat is very clear, but on the side, so not really integrated. Barley sugars, toasted oak and again quite some floral elements, so it cannot hide its young age. It does not need to, surely, but this does taste very young indeed. The finish is medium long with loads of ginger. It starts sweet, then turns bitter to finally fade in a big screen of smoke. Very light peat, rubber, tobacco ash. Fruity too, orange. Also some grassy, ​​hay. And sweet, honey. Light peppers, little salmiak / lakrisal kick, smoke, caramel very emphatically. Very light peppers still, somewhat short, Barbeque smelled now. And honey sweet. Another solid single malt, intense in taste, perhaps less aromatic, mainly salty caramel and smoke, but very interesting. Soft maritime smokes, bonfire, seaweed and flinty notes are well integrated to the chocolate, fresh zesty citrus and grassiness characters of Wolfburn. Still dusty and 'white' on the nose and palate. Not with lots of depth albeit bottled at a 46%, but balanced with firm structure.